We have had to move over to a new mailing list after something like seven years. We still have over 1,000 members. Unfortunately the new list doesn't run to such luxuries as an automated sign up form. Spammers no doubt are one reason for that sorry development. Sadly, to defeat this mongrel scourge I've had to adopt another procedure called reCAPTCHA which is becoming more and more popular to protect forms or sign up email addresses from robot harvesters. A CAPTCHA is a program that can tell whether or not you, the user, are a human or a computer "bot". You've probably seen them — colorful images with distorted text at the bottom of Web registration forms. There is an example picture to the left. CAPTCHAs are used by many websites to prevent abuse from "bots," or automated programs usually written to generate spam. 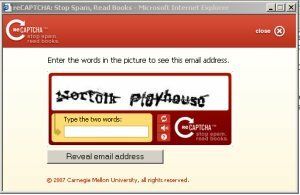 No computer program can read distorted text as well as humans can, so bots cannot navigate sites protected by CAPTCHAs. The subscribing email address is partially revealed to you below. Click on the three blue dots that you see and a small pop-up window [500 X 300] similar to the example at left with two NEW partially obscured words will then appear. The two words in this example were "Norton" and "Playhouse". These words vary constantly. Expect this little pop-up window. When clicking on "..." below, you the user, must solve the pop-up reCAPTCHA before you can see my clickable email address revealed in that little pop-up window. c) no subject is necessary. Simple as that, try it now! the author Ian C. Purdie, VK2TIP of www.electronics-tutorials.com asserts the moral right to be identified as the author of this web site and all contents herein. Copyright © 2000, all rights reserved. See copying and links.